The average cost of assisted living in Waycross is $2,050 per month. This is lower than the national median of $3,345. To help you with your search, browse the 1 review below for assisted living facilities in Waycross. On average, consumers rate assisted living in Waycross 5.0 out of 5 stars. Caring.com has helped thousands of families find high-quality senior care. To speak with one of our Family Advisors about assisted living options and costs in Waycross, call (855) 863-8283.
Review of Baptist Village, Inc.
Waycross is a city in South Georgia with a senior population of around 2,700. Just north of the Okefenokee National Wildlife Refuge, the city provides plenty of parks and trails for those who enjoy the outdoors. To accommodate seniors who require room and board, help with grooming, medication administration and other daily living tasks, there are four assisted living facilities located within the city limits. Also referred to as Assisted Living Communities (ALCs), these facilities are regulated by the Georgia Department of Community Health. The Waycross area is home to world-class medical facilities, including Memorial Satilla Health, in the event of medical emergencies or illness. For seniors who require transportation for errands and medical appointments, the Ware County Transit offers rides at discount prices. For special appointments, a 24-hour notice is required. Seniors who live in Waycross or the state of Georgia don't have to pay state income tax on Social Security Income benefits (SSI). The state also allows a $65,000 per person deduction on all types of retirement incomes. Waycross is one of the most affordable cities in Georgia for seniors to live. The cost of living is 20 percent cheaper than the national average and is 15 percent lower than in other cities in Georgia. This may make it easy for seniors paying for assisted living to have more money left at the end of the month for savings. Seniors living in assisted living facilities in Waycross should inquire about the available security measures in prospective ALCs due to the high rate of crime in the city. The overall rate of crime in Waycross is 66 percent higher than the national average. Seniors who are sensitive to the heat may find summers in Waycross unbearable due to the average highs around 93 and the humidity. Winters are short and mild with temperatures rarely dropping below freezing. Assisted Living costs in Waycross start around $2,050 per month on average, while the nationwide average cost of assisted living is $4,000 per month, according to the latest figures from Genworth’s Cost of Care Survey. It’s important to note that assisted living rates in Waycross and the surrounding suburbs can vary widely based on factors such as location, the level of care needed, apartment size and the types of amenities offered at each community. 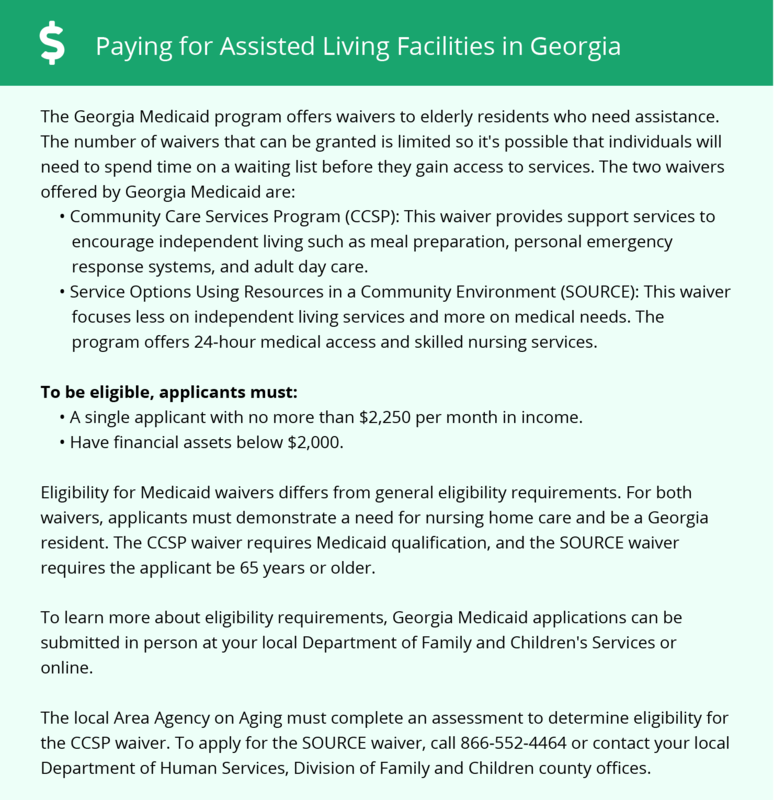 In Waycross and the state of Georgia, there are two Medicaid waiver programs that cover assisted living care for eligible seniors. The Community Care Services Program (CCSP) and the Service Options Using Resources in a Community Environment (SOURCE). While these programs don’t pay for room and board, family supplementation is permitted. Waycross and the surrounding area are home to numerous government agencies and non-profit organizations offering help for seniors searching for or currently residing in an assisted living community. These organizations can also provide assistance in a number of other eldercare services such as geriatric care management, elder law advice, estate planning, finding home care and health and wellness programs. To see a list of free assisted living resources in Waycross, please visit our Assisted Living in Georgia page. Waycross-area assisted living communities must adhere to the comprehensive set of state laws and regulations that all assisted living communities in Georgia are required to follow. Visit our Assisted Living in Georgia page for more information about these laws.